Well, today was the last day of our super wonderful cross country extravaganza. We have spent the last couple days with great friends in Oklahoma and it really was such a great ending to our trip, I am so glad that we were here. It was filled with great food, lots of laughs, and just an all around goodness, I can't wait until we come back!!! Not only did Steph and I make 2 yummy cakes while Jason and I were in town, She, Jenny, and I went to a place called Cuppies & Joe. The place was small and cute. Definitely a nice little place to hang out. It also had a really nice area out front where you could just sit outside and enjoy the day. 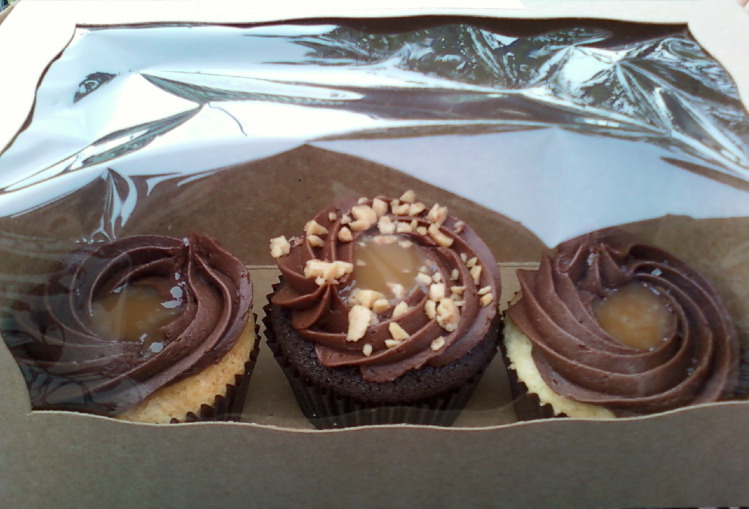 I really liked the names of their cupcakes, especially the Boom Boom Pow, which Jenny and Steph got. I got The Huxtable, mainly because Jason and I love The Cosby's and because it had caramel AND toffee. Holy smokes! The Boom Boom Pow is a vanilla bean cake with a chocolate butter cream, a caramel center, and a sprinkle of sea salt. Kinda perfect huh?! The Huxtable is a chocolate cake with a swirl of chocolate butter cream,a caramel center, and some toffee pieces sprinkled on top! We brought them back to the shop, opened the box, and dug in! Jason really liked the cupcakes, he was in heaven. The girls digged their cuppies, and I have to say, they know a thing or two about cupcakes in Oklahoma City. Although the cake was a little dry, we all agreed that they were yummy and we would certainly be back. So the next time you're in Oklahoma and strolling down NW 23rd Street, swing by and grab yourself a treat! yay for cuppies & joe! miss you already! Yum!!! We'll have to visit Sara Sara when you come back and compare!! Can't wait til you come back again soon!! !